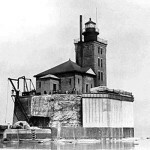 The Port Austin Reef Light is located on Port Austin Reef, Michigan about 1 and ½ miles from the mainland, at the southerly side of the entrance to Saginaw Bay. It is 2 and 1`/2 miles due North of the Port Austin Harbor of Refuge. As a result of a recent survey of the Lighthouse by Spicer Engineering, it is further identified as located North of Section 20, T.19 N.- R.13 E. Pointe Aux Barques Township, Huron County, Michigan and Latitude N 44 deg 04.893 min : Longitude W 082 deg 58.941 min . 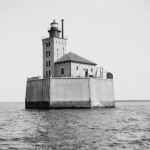 On August 18, 1856 Congress appropriated $82,151.14 for the construction of a Lighthouse located on the tip of the Port Austin Reef. 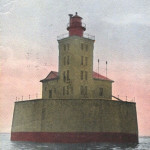 This lighthouse was positioned on the critical juncture of Saginaw Bay and Lake Huron serving as a “turning point” for both northbound shipping and west bound shipping as a turn into Saginaw Bay. 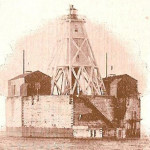 The original light and caisson was built in 1878 and rebuilt to its current configuration in 1937. It is built on an octagon concrete caisson 80 feet across and 34 feet on each side. The concrete deck is approximately 30 ft above the water line with the focal plane of the original fourth order Fresnel lense at 76 ft above mean low water. The original Fresnel lens was removed in 1941 and replaced with a 300 mm glass, and then in 1985; 300 mm acrylic optic. In 2011, the 300 mm lense was replaced with LED exhibitor. The light house consists of two joined structures. 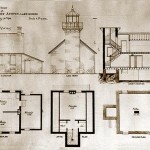 The light tower, which is 16 feet on each side, is six stories high containing a galley, entrance foyer, oil room, three bedrooms, watch deck and lamp room. The Watch Deck and Lamp room is of cast iron precast construction with the living quarter’s tower constructed of double walled “mack” brick. The second structure, known as the “fog signal building” is attached to the tower and is 34 feet square. In addition, other character-defining features include the diamond pattern glazing in the lantern, with the surrounding gallery railing comprised of three tube rails. Stone sills and trim accent door and window openings. The building was not painted, as paver brick construction material –harder than typical building bricks– was designed to withstand severe weather and high traffic. There are sixteen windows in the tower. The building incorporates some details of the Queen Anne style popular at the time, as seen in the decorative brickwork at the top of the light tower, and in the elaborate door, window and baseboard trim profiles on the interior. The first three flights of stairs in the tower are wood, the two upper flights are iron (in the watchroom and lantern). Several original five-panel doors also remain intact. An ornamental detail no longer present are two oversized wood brackets that flanked the door entrance to the fog signal building. Additional information on the historic appearance of the building is that the 1899 pier had cast stone quoins, and was originally surfaced in the same paver bricks as the tower and fog signal building. Original access up the side of the 1989 pier was via an iron pipe ladder. Near the stairs and covered with iron was a privy that overhung the edge of the pier. The fog signal building originally had a red roof with a bronze green cornice; the steam engine for the fog signal building was built by Fulton Iron & Engine Works of Detroit. 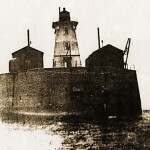 In addition it marked a dangerous reef jutting 1 ½ miles north westerly into Saginaw Bay featured in many groundings and sinking’s including the Howard M. Hannah Jr. which came to rest during the “great storm of 1913 just north east of the light. In 1953 the lighthouse was fully automated, and the last light keepers departed. 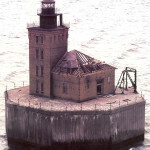 Since that time, and until the Port Austin Reef Light Association obtained a Lease from the USCG, it remained essentially abandoned save the occasional USCG servicing of the 300 mm lens and related batteries and solar charging system. The Coast Guard decommissioned the lighthouse in 1979 and had it scheduled to be dismantled in 1984. Lou Schillinger stepped forward and secured a 5 year license to restore the structure. In 2011, the US Coast Guard applied for admission to the Registry of Historic Places. 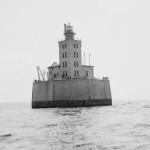 The Port Austin Reef Light is the most noticeable and visible historic landmark in the Port Austin area and dominates the northern Saginaw Bay horizon. The lighthouse is located 2.5 miles north of the entrance to Michigan Department of Natural Resources Port Austin Harbor of Refuge. It serves as an important Aid to Navigation for both commercial shipping entering Saginaw Bay and up-bound in Lake Huron as well as for recreational boating. It shares a common heritage with Grindstone City, the Village of Port Austin, and the Township of Pointe Aux Barques and the Great Lakes Maritime history. Port Austin was originally accessed only by boat and Grindstone City utilized the commercial shipping industry for its only outbound product until the construction of the Port Austin Industrial Railroad in the late 1800’s. The light acts as part of the northern western most point of the Thumb Area Bottomlands Preserve which extends 40 miles south and contains 22 documented shipwrecks. With the opening of the first Port Austin History Center in the summer of 2012, a significant portion of the informational display was dedicated to the Port Austin Reef Light and its contribution to the development of the entire Huron County lumbering, sand production, and grindstone production through the 1930’s. PARLA through the last 2 decades has developed a wealth of documented photographic and archeological materials relating to the Port Austin Reef Light and will be the primary source of that information and display initially. Pointe Aux Barques Township residents share the presence of the original Lighthouse Keepers Residence and the Pointe Aux Barques Lifesaving Station both of which have been expertly rehabilitated preserving the exterior historic fabric. That historic tie will bring numerous additional facts and artifacts to augment that already gathered. One of the residents and former engineer has completed a technically accurate and interesting restoration depiction model now on display in the Port Austin Visitors Center. That model has brought growing financial and informational support and has begun to serve as a de facto “center” for PARLA information distribution and Port Austin Reef Light interest.